NEW: Use Lighthouse as a Data Source – How can we help you today? To create a data source using Lighthouse, go to the New Data Source page in Klipfolio and select the Web Accessible Resource option. 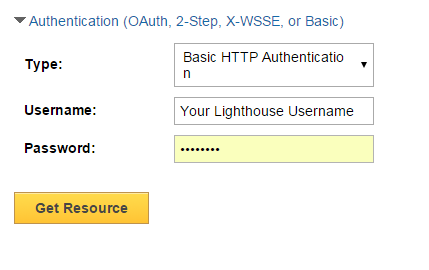 At URL, enter your Lighthouse domain name, for example https://foo.lighthouseapp.com. At Data Format, select JSON (Depending on your query, Lighthouse also provides data in XML format). At Parameters, under Name, enter Content-Type. You'll need to authenticate with an API Token from Lighthouse and using Basic HTTP authentication (your Lighthouse login credentials). To find your Lighthouse API token, you will need to log into your Lighthouse account. Refer to the following instructions by Lighthouse: How to I get an API Token. In Klipfolio, there are two ways you can provide your API token: in your query request or as a Header. Click the plus sign to add a Query Parameters row. At Parameters, under Name, enter X-LighthouseToken. Under Value, enter your API Token. Select Basic HTTP from the drop-down list. At Username enter your Lighthouse username. At Password enter your Lighthouse password. https://foo.lighthouseapp.com/projects.json where: https://foo.lighthouseapp.com is the endpoint URL and /projects.json is the API method.